Quicken Loans has a reputation as a heavy-hitter in the mortgage space. Quicken, which was founded in 1985, announced in Feb. 2018, that it became the nation's largest residential mortgage lender. Quicken Loans’ total loan volume in 2018 was $83.4 billion. Headquartered in Detroit, Michigan, Quicken Loans has provided more than two million American families with mortgages. Quicken Loans is the largest online retail mortgage lender, according to National Mortgage News. Its parent company is Rock Holdings, Inc. Quicken provides only mortgages and loans - it doesn’t offer any banking, investment or other financial products. It does, however, offer a range of mortgage products, including fixed-rate mortgages, adjustable-rate mortgages, FHA loans, VA loans and jumbo loans. You can also use the company’s “YOURgage” feature to customize your loan terms. Getting a home mortgage from Quicken isn’t a matter of driving over to a local branch. The company combines online mortgage application tracking with a legion of representatives who can guide you through your application over the phone. Hate talking on the phone? You may be better off using Rocket Mortgage, an online-only portal from Quicken Loans that lets you complete your entire mortgage application on the web, without speaking to a loan officer. Does Quicken Loans Operate in My Area? Quicken Loans offers loans in all 50 states. It has become a sizeable company in the years since its founding. Quicken has 17,000 employees, based in Detroit, Michigan; Cleveland, Ohio; Phoenix, Arizona; San Diego, California; and Charlotte, North Carolina. What Kind of Mortgage Can I Get with Quicken Loans? Once you’ve decided to dip your toe into the mortgage market you’ll need to decide what type of mortgage to get. You can talk through your mortgage options over the phone with Quicken Loans, but it helps to have done some research into your mortgage choices before you have your initial phone call with a lender. Fixed-rate mortgage: Your interest rate and monthly payments will stay the same for the entire life of this loan. Fixed-rate mortgages are available in 15-year and 30-year terms with Quicken Loans. The fixed-rate mortgage is a dependable home loan option. You know what you’re getting. The steady monthly payments with a fixed-rate mortgage may make it easier to budget. Adjustable-rate mortgage (ARM): Also known as an ARM, this mortgage option from Quicken Loans generally has a lower interest rate when compared to fixed-rate mortgages with the same term - at least at first. At Quicken, its ARMs have an introductory period that can be five, seven or 10 years where the interest rate is fixed. Following the introductory period the rate is adjustable throughout the loan term and can fluctuate up or down. The amount by which the interest rate fluctuates each time it adjusts is generally dependent on a benchmark rate. If you have an ARM your loan terms will specify how many times the rate can change between your introductory period and the end of your loan. The loan terms will also specify a maximum interest rate that your loan cannot exceed. Federal Housing Administration (FHA) loan: This government-insured loan may be a good option if you have limited income and funds for a down payment, and/or a lower credit score. We put together a comprehensive guide to FHA loan qualifications if you want to take a deeper dive. The minimum credit score for an FHA loan through Quicken Loans is 580. You can put as little as 3.5% down when you get an FHA loan from Quicken. Department of Veterans Affairs (VA) loan: These mortgages are backed by the Department of Veterans Affairs. If you are a current or former member of the U.S. armed forces (or the current or surviving spouse of one), you may be eligible for this mortgage. With Quicken Loans you can get a VA loan that’s a 30-, 20- or 15-year fixed-rate mortgage, or a 5/1 ARM. The introductory period on a 5/1 ARM lasts for five years. After those five years the rate will adjust once per year. Quicken has dedicated VA mortgage bankers who can help you through the VA loan process. Credit scores as low as 620 can qualify for VA loans. United States Department of Agriculture (USDA) loan: As of October 2017, Quicken added USDA loans to its government loan product offering. If you're looking to purchase home in a rural area and you make 115% or less of the area's median income, you may be eligible. Features of Rural development loans include 0% down payment and low guarantee fees. Jumbo loan: If you need to borrow a home loan that exceeds the particular conforming loan limit in the area in which you are buying, you will be in the market for what is known as a jumbo loan. In most of the United States, jumbo loans are ones that are greater than $484,350. However, in some counties with pricey real estate, the conforming loan limit is as high as $726,525, meaning that buyers can take out mortgages up to that amount before their mortgage is a considered a jumbo loan. Jumbo loans are viewed as being risky for the lender because government mortgage finance groups Fannie Mae and Freddie Mac won’t buy jumbo loans. Any jumbo loans that a lender can’t sell stay on the lender’s books and expose the lender to the risk that the jumbo loan borrower would default on an expensive home that would be hard to re-sell after foreclosure. To compensate for these risks, lenders may charge higher interest rate for jumbo loans. Still, a jumbo loan may be right for you if you have a lower debt-to-income ratio, a higher credit score and can make a larger down payment. Jumbo loans generally require borrowers to put 20% down. Quicken Loans’ jumbo mortgages let you take out a mortgage of up to $3,000,000. Through Quicken you can take a cash-out refinance of up to $500,000. The minimum credit score for a jumbo loan from Quicken is 700. 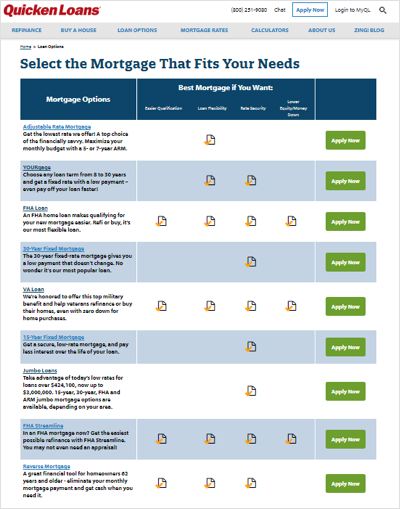 “YOURgage”: If you’d like to customize your mortgage, pick your own terms to meet a financial goal or lower your interest rate, Quicken Loans’ YOURgage might be a good option for you. With this option, you’re able to pick the payment terms of your mortgage based on your goals. While it’s only available in a fixed-rate conventional mortgage, you can get it in all 50 states. You can pick a loan term of between eight and 30 years, refinance up to 97% of your home’s value or purchase a home with as little as 3% down. 1% Down Payment Option: Qualifying applicants may be able to put as little as 1% down on a home purchase by using Quicken Loans’ 1% down payment option. Only purchase loans (not refinances) are eligible for this option. The home must be a single-unit primary residence. It can be a single-family home or a condo but not a second home, co-op, investment property or multi-family dwelling. You must have a FICO score of 680 or higher to participate. In addition, you must earn less than the median area income for your county. Your debt-to-income ratio (how much you owe each month divided by your pre-tax income) must be 45% or lower. If you’re a first-time homebuyer participating in Quicken’s 1% down payment program you will be required to take an online introduction to home ownership course, which Quicken Loans makes available free of charge. 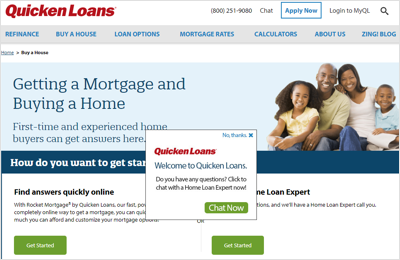 What Can You Do Online with Quicken Loans? Quicken Loans has no physical branch you can visit, so the company puts a lot of effort into its online presence and features. For example, you can check out live mortgage interest rates on the Quicken Loans website. To attract customers who like to do everything online, Quicken Loans offers Rocket Mortgage. Rocket Mortgage is an online portal from Quicken Loans that finds, imports and verifies financial information, and lets you customize your mortgage (purchase or refinance), see if you're approved and lock your rate – all without speaking to a person. It’s a quick, online-only option for the phone-phobic. If you don’t use Rocket Mortgage you’ll be able to start your application online but will need to speak with a Quicken Loans rep over the phone to move your mortgage application forward. You can also bypass the website altogether and go straight to the phone to start your Quicken Loans mortgage process. Whether you opt to use Rocket Mortgage or Quicken Loans’ regular application process, you can access your Quicken Loans account online through their portal, MyQL. You’ll be able to check the status of your loan online at any time, 24/7. There’s also a MyQL mobile app. Would You Qualify for a Quicken Loans Mortgage? If you opt to apply for a mortgage with Quicken Loans you’ll need a minimum credit score of 580 (with a down payment of at least 3.5%) to qualify for an FHA loan. This is lower than the 600 minimum that most lenders require for FHA loans. 580 is the lowest score that falls into the “fair” credit score range. You’ll need a minimum credit score of 620 if you want a shot at getting approved for a conventional loan from Quicken Loans. The higher your credit score the higher your chances of approval. But your credit score isn’t the only important stat that Quicken Loans will consider. Your income, debt levels and down payment savings will also affect your ability to score a Quicken Loan. Twenty percent is the norm for a down payment on a conventional loan, but you can put less money down if you’re willing to pay private mortgage insurance. If you don’t have the 20% down payment needed for a conventional mortgage without private mortgage insurance (PMI), you may be interested in Quicken Loans’ PMI Advantage option. With this option, you can get out of paying monthly private mortgage insurance by opting for a higher interest rate at closing, or by paying all your PMI in one lump sum at closing. The former option means you’ll pay more interest over the life of the loan (as with the Closing Cost Cutter, more on this later). The latter option can be advantageous if the seller of the home you’re buying is willing to pay your PMI to sweeten the deal. Income isn’t everything in the mortgage market. Lenders prefer to look at your debt-to-income ratio, so an applicant with a high income isn’t a shoo-in if he or she carries hefty debts. Like other lenders, Quicken Loans generally accepts a maximum debt-to-income ratio of 43%. Your debt-to-income ratio is calculated by taking your monthly liabilities (e.g. car loan payments) and dividing them by your gross (pre-tax) monthly income. If you’re planning to participate in Quicken’s 1% down payment program your debt-to-income ratio can be as high as 45%. However, you must earn less than the area median income in your county and have a FICO score of at least 680. If you’re a first-time homebuyer opting for the 1% down payment program you must take an online homeownership course. What’s the Process for Getting a Mortgage with Quicken Loans? You can apply for a mortgage with Quicken Loans online or over the phone. You’ll be matched with a Home Loan Expert who will guide you through the mortgage process. After your credit score is pulled, you’ll get a loan estimate (or a prequalification letter) via the site’s loan portal, MyQL. To continue the mortgage process, you’ll need to submit a deposit which covers costs incurred to process your credit report, appraisal and title work. When you close on a house, this deposit is credited against your total closing costs. Quicken Loans says that the amount of this deposit varies between $400 and $750. Your Quicken Loans Home Loan Expert will let you know what you owe. You can use credit, debit, pre-paid Visa or MasterCard gift cards to pay the deposit, but not checks, money orders or cash. You can also get a credit toward your closing cost by opting for a higher interest rate when you get a mortgage from Quicken Loans. Quicken Loans calls this option the “Closing Cost Cutter.” If a lack of ready cash is your problem and you want to reduce your closing costs, the Closing Cost Cutter may be an appealing option. However, it’s important to understand that opting for a higher interest rates means you’ll have a higher monthly payment and pay more interest over the term of the mortgage. Once Quicken Loans has verified your credit and assets you may be pre-approved for a loan. At any time between applying for a loan and closing on your home you can get in touch with a Quicken Loans representative by email, fax or phone. If you use Quicken Loans’ Rocket Mortgage you can apply for a loan entirely online and authorize Quicken Loans to import financial information (such as your checking account balance) for you so you don’t have to upload them yourself. If you start an online application through Rocket Mortgage and then realize you want to speak to a human you have that option at any point in the application process. Quicken Loans Inc. is the nation’s largest online retail mortgage lender and the second-largest retail mortgage lender (online or brick-and-mortar) in the U.S. Quicken loans also prides itself on being what its website calls “the nation’s leading Veteran Affairs (VA) lender and the largest FHA lender.” In other words, lack of experience in the mortgage space is not a concern when you’re dealing with Quicken Loans. And if you have low credit, Quicken Loans can be a great option. Unlike competitors such as LoanDepot, Quicken Loans offers FHA loans to borrowers with credit scores below 600. How does Quicken Loans compare to other players in the online mortgage lending space when it comes to the breadth of its offerings? Quicken Loans does not offer home equity loans or home equity lines of credit (HELOCs). The most similar product it offers is a cash-out refinance. If you have your heart set on a home equity loan you’ll need to head to another mortgage provider that offers these loans – a competitor such as LoanDepot. Another option for a home equity loan or home equity line of credit is to go to a traditional bank lender such as Citi, Chase or Wells Fargo. These lenders, because they have brick-and-mortar branches, also have the advantage of the personal touch if you feel more comfortable completing the mortgage application process in person. SmartAsset created an affordability index to locate the most affordable housing markets in the country. Zoom between states and the national map to see the top markets in each region. This interactive map allows you to see the most affordable big cities in the country and in each state. Also, scroll over any city to learn about housing affordability in that market. Methodology There’s a lot more to home affordability than the price a homebuyer agrees to pay the seller. To find the most affordable places to buy a home, SmartAsset took a holistic approach, considering closing costs, real estate taxes, homeowners insurance and mortgage rates in our analysis. Specifically, we found the total cost over five years of these four expenses—closing costs, taxes, insurance and mortgage payments—for the average home in every city in the U.S. with a population greater than 200,000. We then took that five-year cost as a proportion of median household income in each city to determine affordability. The most affordable cities were those in which total housing costs on an average house accounted for the smallest proportion of the median income. *For this study we looked at all U.S. cities that have a population greater than 200,000 with available data.